Oh, Yummy! 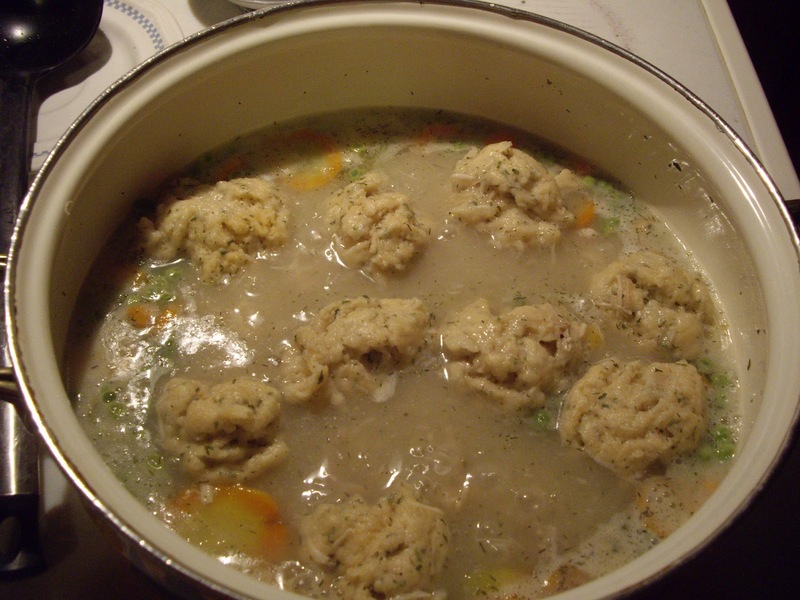 I make my chicken and dumplin's with carrots, celery and onion and make the dumplings similar to yours. We also like our broth on the thicker side. I will have to try adding peas and adding the dill weed to the dumpling mixture next time. Great idea! I'm going to go check out your deviled eggs post now. My husband loves them and I've never learned to make them. My granny would be proud to know I'm finally going to learn how. Celery sounds like a good add in too. Your husband will be glad too, I bet. I love dumplings, too, but they never seem to come out when I try to make them. Thanks for sharing your recipe! I love dumplings & stew! Visiting from the A to Z. Enjoy the rest of the challenge. I never had them growing up. My dad liked them but Mom didn't so she never made them. I don't know why, they're so good. You don't want to overmix the dough. Just stir until it is mixed and stop. Stir the milk and oil in carefully, don't beat it. This looks fantastic! I love chicken and dumplings like my mother, but I have never tried dumplings and stew. It is going to be on in my life this weekend! Thanks soooo much. My dumplings never come out right. I'm going to try these! Chicken and dumplings are my fave and yours look great. I could jump in the pot. I love dumplings. Thanks for the recipe it looks soooo good. All your recipes look good. Now I'm hungry. i am all the time making beef stew will have to try your wonderful dumplings in it next time! Sometimes it just takes practice. Aww brought back childhood memories, my mum used to make chicken in dumplings, with the veggies and all. Hmm now that I think about it, out of my nearly 30 years cooking I've never made them. I will have to give it a try now. Let me know how they turn out. I have thought about trying them in beef, but never have. Just turkey or chicken. That's a nice memory to have.